As a reaction to throw-away culture in the years following the recession, we have seen age-old woodworking techniques such as cabinetry and parquetry become the focus of high-profile design projects. At Maison & Objet we saw this long-term design movement continue to develop as designers find new ways of working with this durable, fundamental, and essential material to create contemporary design. This lightweight stool and circular table are hand crafted by Japanese designer Akiko Kuwahata, who is known for creating high-quality utilitarian objects in wood. For her STiTCH collection, the Denmark-based designer used steam to bend four-millimeter-thick maple veneer and then stitched it together with heavy, blue-wax string. Kuwahata was actually inspired by an old embroidery ring from Japan, which is made in delicate softwood and stitched together with cherry bark. The design was exhibited at Maison & Objet as part of the Danish Crafts Collection’s CC16 exhibition curated by Nina Tolstrup. Also created using the Ottchil technique, these tape measures were made by master of woodwork Kim Wan-Gyu and designed by Jeong Seok-Yeon. Together, Danish textile artist Lisbet Friis and architect Uffe Black designed the Wallpapered table; a portable trestle table with a patterned surface made in ash wood and plywood. The graphic pattern is printed directly onto the wood using a technique developed by Friis. This ultra-thin wood by Japanese brand Woodum is woven into fabric to create upholstery, pillows, placemats, and bags. The lampshades are made by fellow Japanese brand Cuiora from tightly rolled lengths of recycled paper. 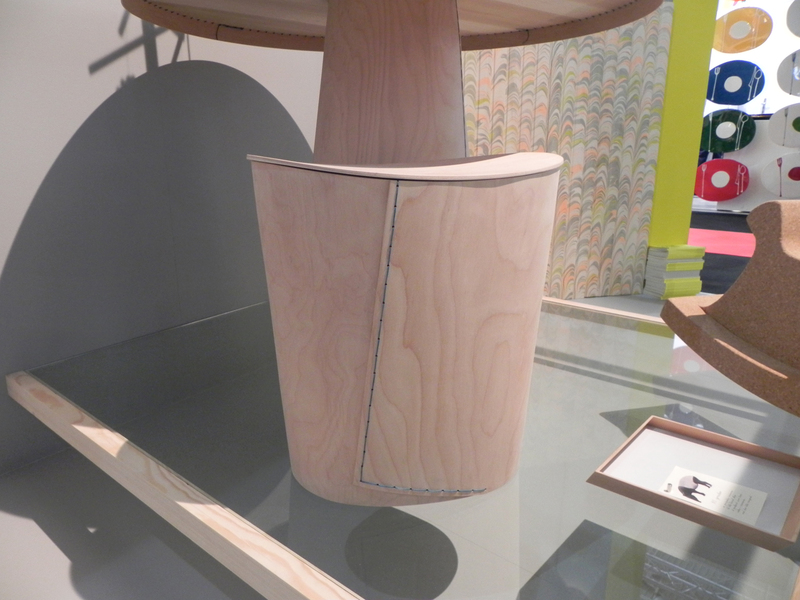 This handy storage concept by Parisian brand ENO finds a new function for the traditional wooden bristle brush. Italian brand Slow Design employs the skills of Tuscan artisans to transform old glass bottles into new decorative vessels with lids turned from local ash and olive wood. Triangular–, square–, and diamond-shaped wooden boxes have magnets embedded into the sides so that they can join together to create endless geometric patterns that function as a super beautiful desktop organizer. Made by Japanese brand Colors, the MagContainers are available in Walnut, Japanese quince, and Tamo wood. Another magnetic wood design was by Brooklyn-based designers Fort Standard. Their wooden Magnets for SCP turn any metal surface into a pin board and are even strong enough to function as hooks for bags and coats. Twenty giant wooden beads are strung onto the cord of Berlin-based design studio Llot Llov’s Earl lamp. The idea is that the angle and the height of the lamp can be easily adjusted by looping the cable around the beads. Pernille Snedker Hansen’s Marbellous wood made a big impact on design blogs and Pinterest boards around the world when she launched it in 2011. For Maison & Objet, the Danish Drafts Collection CC16 exhibited a series of tongue-and-groove marbled wood panels, which Hansen designed to clad a cabin in the forest. Usually reserved for making model aircrafts, untreated balsa wood has been used by Nomess Copenhagen to make a modern version of the classic vanity table called Balsabox. The box is incredibly lightweight and consists of a series of sliding trays with small storage compartments. The back of the lid doubles as an adjustable mirror. Last but not least, we loved British designer Matt Pugh’s decorative wooden Owls, handmade at his studio in Bath.